Goal Setting for the Marathon …. It is a great question, and seemingly one that you would think you could automatically answer if you were a runner like me who times and measures every single one of the now more than 1,989.83 miles that I have run over the last 365 days. I know that my average run or race is 8.19 miles. I have climbed 55,200 feet of hills. I have averaged 8.1 mph for those 1,989.83 miles. Running for a total of 244 hours, 49 minutes and 48 seconds. That’s about 10 1/2 days of doing nothing but running. So how fast are you going to run that 26.2 miles Joe? Honestly – I don’t know, but I’m going to find out. The marathon is truly a different animal when it comes to achieving a time goal. For races such as the 5K up through the half-marathon, if you have been training and are “in race shape” – you can run very close to your potential on just about any given race day as long as you are not injured, not sick and do not have extreme heat, wind or humidity to deal with. The races are short enough that you can “tough it out” or “dig deep” late in a race and hang in there until the end. Sure you may run a 5K :15 seconds slower one day vs. another or perhaps miss your goal in a 10K by :30 seconds. Even in the half-marathon out in Denver in 2 1/2 weeks I can predict with great accuracy the kind of race I am going to run that day. That is a 13.1 mile race on a course I have never seen before, at an elevation of 5,300 feet above sea level, which I am not accustomed to. Dollars to doughnuts I will run within :30-:45 seconds +/- of 1:25:45. But the marathon takes you places that are tough to predict. It becomes a race as much about nutrition, hydration and mental toughness as it does about fitness and running ability. 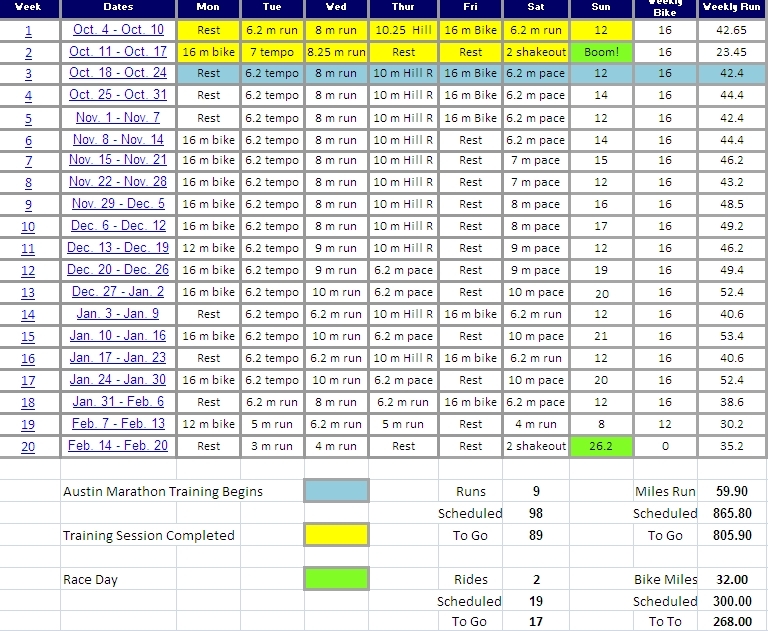 Unlike the shorter races, where we will have covered that many miles and much, much more usually in countless training runs, for example you need to turn back the calendar all the way to April 17th to find the last week where my Sunday long run was not at least 12 miles. In 14 of the last 16 weeks, my Sunday run was at least 14 miles. Longer than a half-marathon. 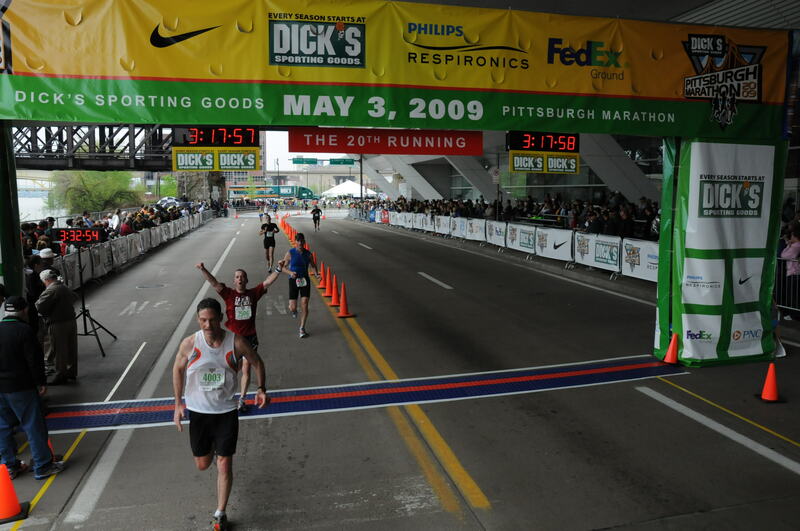 So when it comes to the half-marathon or 13.1 mile race – I’ve been there. I know what it feels like. I know how much energy I have in the tank over the opening mile and how to dole it out evenly and consistently before I empty the tank sprinting the final 400 Meters to the finish line. The marathon is all about patience and being able to hold back your legs to stay on your target pace early in the race when running :05 or :10 faster per mile FEELS exactly the same as your target pace. That is the trick in the marathon. Because you taper your workload and training down the final 2-3 weeks before race day, your legs feel fresher than they have felt in MONTHS! If you have decided to go for a 3:10:00 time in the marathon which is 7:15 min./mile pace – to the marathoner that morning, running at 7:05 pace truly feels like 7:15 did during training. But if you are not trained to run at that 7:05 pace, and are not capable of sustaining it, those :10 per mile on the first half of the course will easily cost you :30-:45 seconds per mile if not more on the back half of the course. You gained 130 seconds during the first half of the race, but lost 390-585 seconds on the second half. Those 585 seconds equate to 9 minutes, 45 seconds. When you remove the two minutes and 10 seconds that you were “fast” on the front half, your net time is now 7 minutes and 35 seconds slow. Your target time of 3 hours and 10 minutes just became a finish time of 3:17:35. That is how much a slight miscalculation early in the race will mean over the course of the marathon. Just :10/mile too fast costs you dearly. So how do you arrive at a proper and attainable race goal? By proper, I mean a goal that is appropriate for your level of fitness and talents as a runner. One that is not a lay up by any means as if achieving a time goal in the marathon is the driving force behind your race, you want to pick a challenging goal and chase it down. That is the point in it for a lot of runners. Those are all GREAT goals for the marathon. But if you are going to try to challenge yourself by setting a time goal, you want to pick one that is “proper”. Secondly, you want to choose a time goal that is “attainable”. There are a lot of marathon “calculators” out there that will tell you what your capabilities are in the marathon based on a time that you ran at a shorter distance race. The McMillian Running Calculator found HERE is the one that I rely on the most. The premise is that you enter in a recent race time for the 5K, 10K, half marathon, 10-miler – virtually any traditional race distance – and the calculator will show you what you are capable of in the marathon. For example, my recent 10K time running the in the triathlon relay of 38:50 when entered into the McMillian Pace Calculator shows that I am capable of running a 3:02:15 marathon, based on my 10K performance. If I enter in my 10K time from last October’s IBM Uptown Classic of 38:06, the McMillian Running Calculator shows that I am capable of running a 2:58:48 marathon, based on my 10K performance. 1. Which time is the most recent? Putting in a PR that is close to a year old is probably not going to be as accurate a predictor than a race just a few weeks ago. 2. Race conditions? What was the situation surrounding the event? At IBM I had a proper taper period, I warmed up as I normally would for a road race and ran in 60 degree temperatures. At the Triathlon relay I did not taper, I sat around for 3 hours waiting to run. I did not have a proper warm-up as I did not know when Ed would return from the bike leg and the temperature was over 90 degrees. I also had a 400 Meter sprint out of the transition area before I hit the timing mat to start the clock. Neither race then is really very helpful. But picking a midpoint between the two races might be a much better idea. 3. The longer the race distance used, the more accurate the calculator will be. Point being that putting in a time that you ran in a mile race will need to be extrapolated much further out to 26.2 miles than say a half-marathon time. The best scenario would be to run a half-marathon, close to the target marathon, in similar or slightly more difficult conditions. Whatever that half-marathon time is, input it into the McMillian Running Calculator and WALA – you have a pretty accurate gauge for your marathon capabilities on race day. If you are catching on, that is exactly why I will be toeing the line 4 Sundays before New York City at the Denver Rock n’ Roll Half Marathon. It will provide me with a great litmus test as to where my marathon training is just a month before race day. The race temperature(s) should be very similar in Denver in October at 7:15 a.m. MST vs. New York City in November at 9:40 a.m. EST. New York may be a bit more hilly, but not by much according to the elevation charts of the two courses. Certainly not as hilly as the routes I run here training in Austin. There could be more wind in New York, but the altitude difference in Denver will of course add a degree of difficulty that New York City cannot match. There are a lot of easier formulas out there, such as the old – “double your half-marathon time and add 10 minutes.” or Hal Higdon’s “multiply your 10K time by 5”. These are all generally accepted, solid estimates for your marathon capabilities on race day. The key points from my perspective are that you must have a “litmus test race time” that is only 4-8 weeks “old” if you want an accurate gauge as to where you really are. And secondly, you of course have to be preparing for the marathon in a serious, organized way. Just because you can run a 38:30 10K does not mean you can run a 3 hour marathon. You have to train to run a marathon, including all of the long runs, tempo work, hill work etc. to be ready. Without that preparation you will fade and fade badly over the last 6-8 miles of the marathon. The tune-up half marathon has become a key part of my marathon training 4 weeks prior to race day. Just today, looking ahead to the Boston Marathon in April 2012 I registered for the Shamrock Half-Marathon in Virginia Beach on March 18th. It will give me a great peak behind the curtain a month before race day in Hopkinton, MA to let me know exactly what kind of race I am capable of at Boston. As for New York. I have a number in the back of my mind that I know I need to hit in Denver to make a run at 3:00 hours at New York. Whatever the finish line says in Denver on October 9th is what it says. I have the digits memorized and before I slow to a walk after crossing the finish line I will know if we are ready to chase 2:59:59 four weeks later. 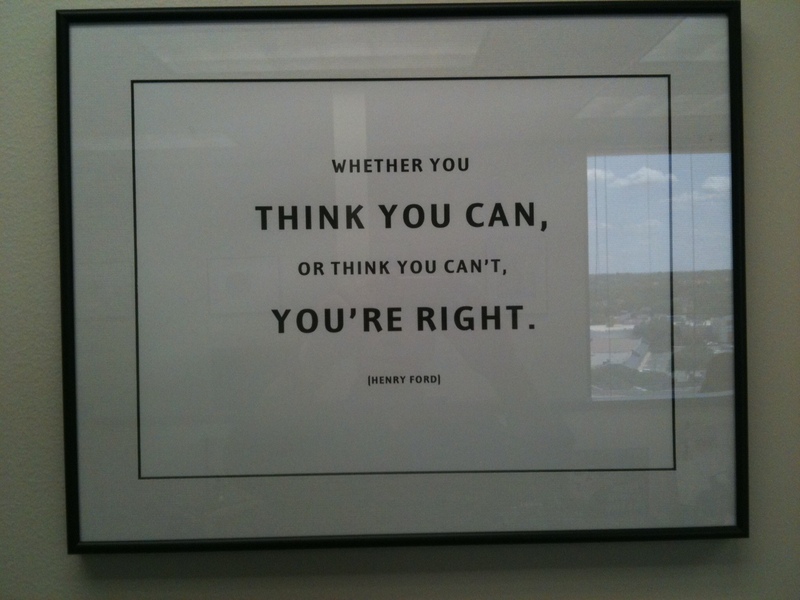 There is a print that hangs in our office here in Austin that reads – Whether you think you can or think you can’t, you’re right. 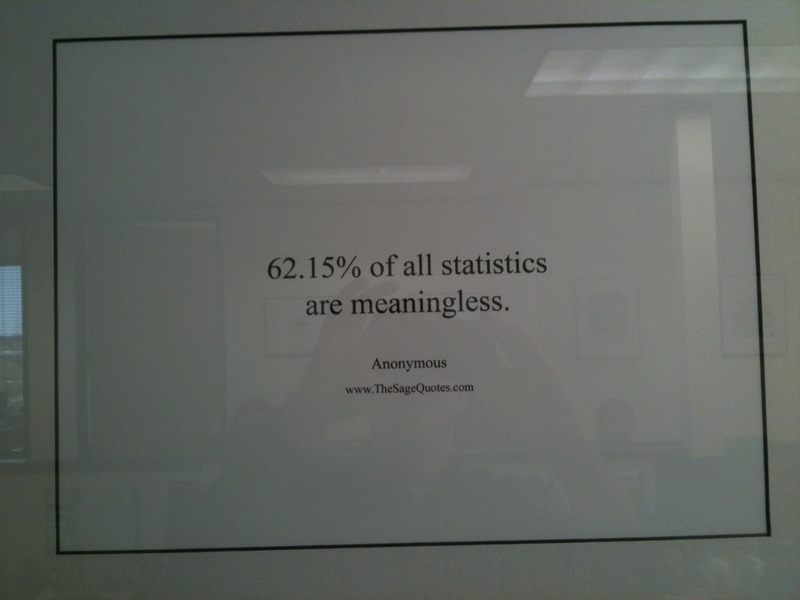 Of course there is another one that hangs just three feet to the left of it that reads – 61.5% of all statistics are meaningless. I always enjoy your thought process and analysis to get to your end goal. After watching what you’ve done in the past year+ it’s definitely helped me be much more intentional in my training and goal-setting. I’m looking forward to these next few weeks for you and how it all comes together. David – thanks for the visit and the message. You’ve put together some great training and racing yourself this past year and a half. Really excited to see where you end up next! Thanks for all the great support. Going to be a big next 7 weeks or so. I know Dom would be excited for NYC. Great post Joe. This is one I will hang on to. I have not put as much time and thought into the pacing challenges for the marathon and it is very thought provoking. I will be pulling for the sub 3 hour for you. I think you are there. Thanks Trey! Excited for your 24 hour race this weekend. Man, it sounds like you are dialed in and ready for the race of your life.